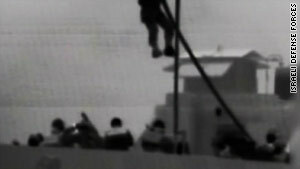 An image taken from video footage released by Israel Defense Forces of the May 31 raid on the Gaza aid flotilla. (CNN) -- Israel acknowledged Sunday that it edited recordings of what it said were anti-Semitic and anti-American radio calls by pro-Palestinian activists who tried to run the Gaza blockade and that it could not identify the origin of the broadcasts. The Israeli military released a 26-second recording Friday night in which a warning call to a ship in the flotilla was met with the reply of "Shut up -- go back to Auschwitz." After another voice reports that the convoy has the permission of Palestinian officials to dock in Gaza, a third voice responds, "We are helping Arabs going against the U.S. Don't forget 9/11, guys." But after the organizers of the aid convoy accused Israeli officials of manipulating the tapes, the Israel Defense Forces reported it had mistakenly identified one of the six ships in the activists' "Freedom Flotilla" as the source of the broadcasts. And it released a nearly six-minute recording of radio traffic that included those calls and several others, along with bursts of static and calls in other languages on the same channel. "So to clarify: The audio was edited down to cut out periods of silence over the radio as well as incomprehensible comments so as to make it easier for people to listen to the exchange," the Israeli military said in a statement posted on its Web site. And it added, "Due to an open channel, the specific ship or ships in the 'Freedom Flotilla' responding to the Israeli Navy could not be identified." Israeli commandos intercepted the convoy at sea on May 31 and stormed the largest vessel, the Turkish-flagged Mavi Marmara, killing nine people aboard. The ships were carrying humanitarian aid to Gaza, the Palestinian territory that has been blockaded by Israel since its takeover by the Islamic movement Hamas in 2007, and the deadly raid sparked international condemnation. Convoy organizers from Free Gaza said Israel "doctored" the recordings "in order to paint the flotilla passengers as anti-Semites." The group denied its vessels were the source of the broadcasts and said the Israeli accusations made "no more sense with the explanation." "All radio transmissions on the sea are heard by all captains," the group said. "Once again, Israel is caught in a lie trying to defend itself for the murder and mayhem it committed the morning of May 31, 2010." On the full recording, an Israeli warship hails one of the vessels in the flotilla to warn it was approaching a blockade zone and warned that "all necessary measures" would be taken to prevent it from docking in Gaza. After three warnings, Free Gaza activist Huwaida Arraf replied that the blockade was a violation of international law and that the convoy was carrying only humanitarian aid. "We do not carry anything that constitutes a threat to your armed forces," she says on the recording.